Today in The Lounge, Nick chats with Jeremy Bauer and Jason Clifton of Bauer Clifton from Juneau, Alaska. They discuss how Bauer Clifton got its start, the challenges of establishing a design firm in such a remote area, what they love about it, and where they are going in the future. Jeremy had been interested in design since childhood. He would build forts and work with his grandpa in his woodshop, and during school he decided to make a career out of his passion. He earned a double major in Engineering and Architecture at Kansas State University and then pursued jewelry for ten years after graduation. After that, he decided interior design was where he wanted to be. The house he and Jason share is from the 1960s with a mid-century modern design that they liked and decided to keep. They remodeled the lower level of the house and upgraded some of the materials, however. Jeremy would still like to renovate the tower room as it is too simplistic and calling for a splash of style. Jason’s favorite place to shop is Ted Baker because of their combinations and variety of color. While he loves shoes, lapel pins, and eyeglasses, his favorite fashion accessory is socks. Jason sees bold, brightly patterned socks as a great way to add color to any outfit. He found himself in Alaska after going on a family cruise there during a quarter-life crisis. The majesty of the northernmost United State took his breath away, so upon returning home to Indiana, he began planning his relocation. He moved to Alaska six months afterward. Jeremy had moved there a few months prior and through a statewide network of friends, the two were introduced. After a few months, Jeremy and Jason connected over their shared agricultural, midwestern background as well as their love of design. Bauer Clifton not only works with design, but with homeowners, contractors, and the final placement of their designs. The office handles all the building materials and furnishings required for projects; something which has always been a part of the firm. They developed a niche market in the design community after founding Bauer Clifton in 2007, where they were the first of their kind in Juneau, Alaska. When they realized they needed more options than what was available at the local lumberyards, they reached out to well-known brands around the world and opened their eyes to the potential Alaskan market. Thereafter they expanded Bauer Clifton into a firm and showroom. This was after disproving to large brands that there wasn’t enough of a market in Alaska and convincing others to adjust their minimum requirements to suit the low population in exchange for correct representations of their products. Bauer Clifton now caters to lodges in Yukon and British Columbia, Canada, as well as Seattle, Washington. They experience very little competition from other firms in Alaska and with what competition does exist, there is a respectable split between them. Bauer Clifton’s designs primarily target kitchens and baths, but over the years have developed into full home remodeling. They replace many old materials with new ones and due to Jeremy’s background in architecture and Jason’s in design, they take a holistic approach to their work. 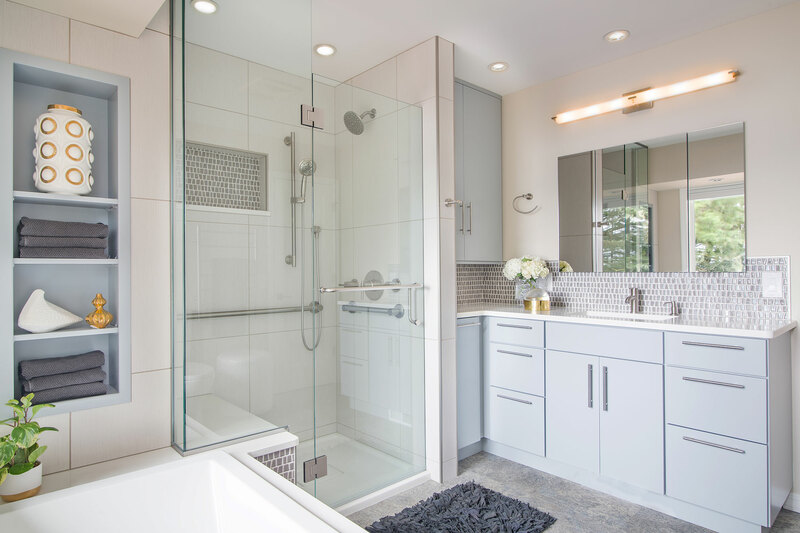 They generally work on twelve to eighteen projects at a time, which can be anything from room and paint consultations to remodeling a bath or home. The days between larger projects are used to work on smaller ones. They have other interior designers working with them as well and things are ever-changing. As with any job, previous experience from other jobs or internships is preferable. They usually look for college graduates who have worked at other firms before. They look for the applicant’s style, what inspires them, and whether they have experience working alongside others. A development of personal style and a clear thought process is looked for in the applicant’s portfolio. The applicant must also have a commitment to Alaska, for Bauer Clifton seeks long-term, reliable Junior Designers to be part of their team. Over the years, Jason and Jeremy have divided their work organically. Jason keeps in touch with the clients while Jeremy keeps up with the contractors. Jeremy’s technical background makes him enjoy working with contractors more while Jason’s creativity helps him work better with clients to solve design problems. Jeremy also takes care of the financial side of things, but he and Jason work together on marketing. Bauer Clifton has always been a collaborative endeavor. It was born in their home office which gradually grew into a living showroom. They had remodeled the house to fit their style and it wasn’t until they hired their first full-time employee that they decided to move into a commercial office. From there, their professional lives grew and have been growing ever since. Bauer Clifton recently renovated and opened a 4,000-square foot former Blockbuster and made it into a mixed space with three residential units upstairs and three commercial suits downstairs. They occupy one of the commercial suits and rent out one of the residential suites on Airbnb. They took inspiration from high-design boutique hotels from around the world and wanted to bring that flare into Alaska. The other commercial suits downstairs are occupied by Modality Therapeutic Wellness which is a collective of three established therapy businesses that operate under the same roof. This enabled Bauer Clifton to work with each of them individually to ensure that the space would be tailored to their industry. In fact, Jeremy and Jason had picked the businesses they wanted in their space before they began renovations in order to attract specific clients better. The most challenging vendors Bauer Clifton works with are the appliance lines. This includes Thermador, Bosch, American Range (commercial and residential), and Bluestar. These brands hold terms and contracts with designers in order to be hosted in a showroom which have a high minimum which can be difficult to achieve in a market as small as Juneau’s. Bauer Clifton was able to convince these brands to give them a chance and have since met and exceeded those minimums. Bauer Clifton’s showroom extends from flooring, hardware, and countertops to furnishings. They enjoy working with Showplace Wood for their flexibility of customization and cabinetry products. They also have Jaipur rugs and products from Cravt Original. All of the new lines are acquired using the same formula that was used to acquire the older ones. The hardest part of working with vendors is finding brand representatives. It can be difficult to find someone who is passionate about Alaska, so Bauer Clifton looks for representatives who can make at least two trips to Alaska every year. They prefer that the representatives check in with them on every order so that both parties are kept up to date with any changes. Bauer Clifton also makes it a point to attend markets which enables them to meet with their representatives on a more frequent basis and develop closer relationships with them. While Bauer Clifton could have survived in Alaska without a retail component, it would have been a greater challenge. They would have had to sacrifice designs because they wouldn’t be the ones to procure the materials necessary for the designs. Additionally, it provides a source for local designers and architects to draw from where there wasn’t one before. Jason and Jeremy own a floral shop called Frenchie’s Floral Studio in addition to Bauer Clifton. The idea came to them when they realized Alaska was devoid of flowers that weren’t dyed or assembled in a grocery store and that they missed the abundance of flowers in their hometowns. The store was launched in July of 2016 and named for their love of French bulldogs. Learn more about Bauer Clifton at www.bauerclifton.com and check them out on Facebook and Instagram. You may also find Frenchie’s Floral Studio on Facebook and learn more about them. YOU CAN WIN A TRIP TO SPAIN!!!!?!?! Check out the rules here.